00010110 (bit 7 on the left and 0 on the right) = Red intensity (0*4 + 0*2 + 0*1 = 0), green intensity (0*4 + 2*1 + 1*1 = 3), blue intensity (0*2 + 1*1 = 1) That is a mix of medium intensity green and weak intensity blue. You can specify a colour using the RGB function. But i find using the BIN function more easy to use in this situation. Specifying colour intensity in 0.15 intervals between each level is messy as done within the RGB function. where b is any number in the b interval. So for instance to activate interval 1, you could set b to any value between 8-15. Also notice that the channel number is not really needed, since only one bias value can be active at any time no matter how many displays you have activated. Is there more to SET BIAS than what I have described? Well, either your way of explaining it is a bit strange or your understanding went astray somewhere. The bit assignment of RGB values is correct as you described. BIAS works by replacing the lower 5 bits of the values of colours 0 to 7 with its content. E.g. if colour 0 is C7+C6+C5+C4+C3+C2+C1+C0 then colour 8 is C7+C6+C5+B4+B3+B2+B1+B0, where C means the bits of the colour, B means the bits of the BIAS and the number of power you raise 2 in the given bit position. Another somewhat related fact is that the four levels of the blue component are equivalent of the other two components' 0, 2, 5 and 7 brightnesses. Unfortunately, I have no idea how all this translates to IS-BASIC's RGB function. More easy view in EP color table. if I understand well, what you wrote is true in basic. You can set any value for bias color range, bias will not change, ex if you set 0-7 to bias in Basic, bias HW setting will be 00h in all case. As ergoGnomics describes in his mail, the top 5 bits (00011) translates into the BIAS set number and the low 3 bits provides the index of the colour in the BIAS set. 00011 = 3 (That is BIAS set 3). 011 = 3 (Colour in BIAS set). A set has 8 colours, so for instance colour 8-15 are members of set 1. So you have to multiply the set number with 8 to get a number within that set. And as the 8 colours from a set are mapped to palette colour 8-15 you have to add 8 to the index of the colour in the set when specifying your ink. Here is some code, that demonstrates how it works. The cool thing is that the bit pattern for the number of the colour also implicitly has information about the intensity of the RGB colours used to mix it, as well as information about BIAS sets and colours. So knowing any of the three facts can be used to deduce the others. If I remember well RGB is quite simple too, you specify the intensity of the colour by the numbers. Well... In fact I think I do understand how the RGB function works. But it is very convoluted. The values you specify between 0.0 and 1.0 are translated to intensities based on their bit patterns. You therefore have to understand how bit patterns are translated to intensities - discussed in some earlier mails in this debate. But if you know the bit pattern used to specify intensities and therefore the colour, you already have the answer (the colour number) and do not need an RGB function. So the function is nearly useless. It would have made sense if you had entered the intensity values directly like this RGB(3,3,0) with values ranging from 0-7 for RED and GREEN and 0-3 for BLUE. Here are the patterns created by the RED component. Similar patterns with other bits provides the GREEN and BLUE component. These three patterns are then OR-ed and the resulting bit pattern is the colour number you can use in a COLOUR or INK or PALETTE command. ergoGnomik and not ergoGnomics, please. I'm not multiple persons nor any kind of science. Your table somehow has the 3 twice while 2 is missing in the Intensity column. And that RGB mapping looks to be some weird sh*t. Never would've guess it working that way. And a question somewhat pertaining to the topic: Why do you keep referring to BIAS as set? AFAIK, BIAS modifies the first eight entries of the palette to derive the second eight. That is not something existing in itself. When I started to look at how colours work, I expected a table of values somewhere in memory for the 256 colours. But it seems that colours do not need a table if the bits in the colour number are used, as thet are in the Enterprise. The bit pattern provides the RED, GREEN and BLUE intensities that define the colour. Therefore colours 0-7 have their intensity definitions made from their matching bit patterns 00000000 - 00000111. So colour 7 is made from RED(1), GREEN(1) and BLUE(1). The 256 colours are divided into 32 parts, each of 8 consecutive numbers. 0-7, 8-15, ...248-255. If you want the location of colour 14 (00001 110) it is item 6 (items indexed from 0-7) in part 1 (the second part) among the colour groups. I call these groups for sets. I think colours are implemented in this way, because you only have 256 colours, and it turns out you can save 256 bytes of memory if you can represent the intensities with every third bit instead of the first three bits for RED, the next 3 bits for GREEN and the last 2 for BLUE. Thus a colour's number doubles as the intensity definition, and you don't need to store anything explicitly. It is all very clever. Thanks! I am familiar with that page, which is all you need for normal use. What it does not tell you is why the colours are in the order they are (How they are defined and constructed). I hope this discussion has clarified that. If I have a full colour picture - like a jpg photograph, is there any way to choose the best palette to approximate the picture on the Enterprise? If we had free choice on all of the 16 colours, then I could just use a PC to reduce the resolution and dither it to 16 colours. Then convert that 16-colour palette to EP colours by taking the most significant bits of the RGB values. But because of bias, we don't have complete freedom over 8 of those colours. Does anyone have any suggestions for how to make a "best choice" for the bias? IstvanV's wonderful ep128emu package also has an image converter utility that works almost miracles. And, as the whole package, comes with open sources. You should take a peek to see how it can be done. IstvanV's wonderful ep128emu package also has an image converter utility that works almost miracles. 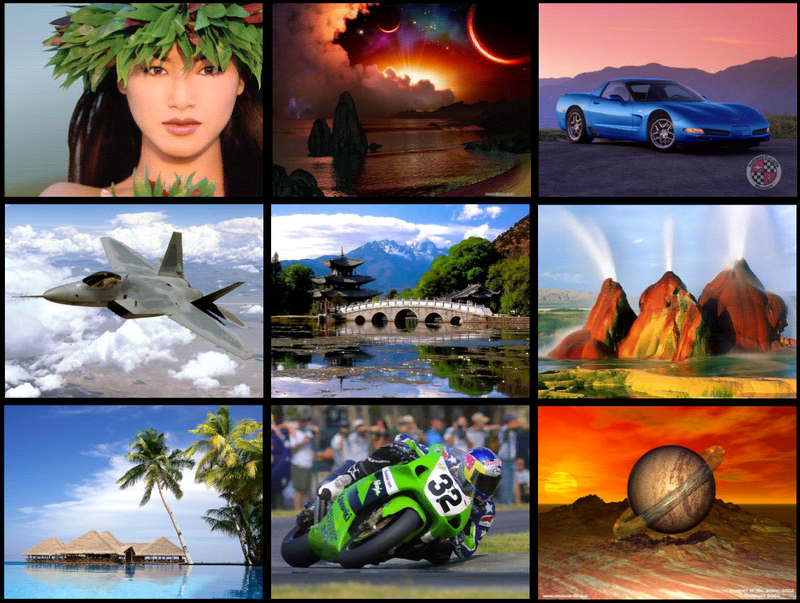 There is some examples of converted images.